Now she is worried, searching everywhere, and this time I am completely innocent. I did not leave the cupboard door open, after all I do not have opposable thumbs. If Mrs. Human forgets these things, then it is her problem. I waited a few cats whiskers, expecting her to return and close the door, but she had more important things to do it seems, although personally I am of the opinion that there is nothing more important in the life of a human than a feline. 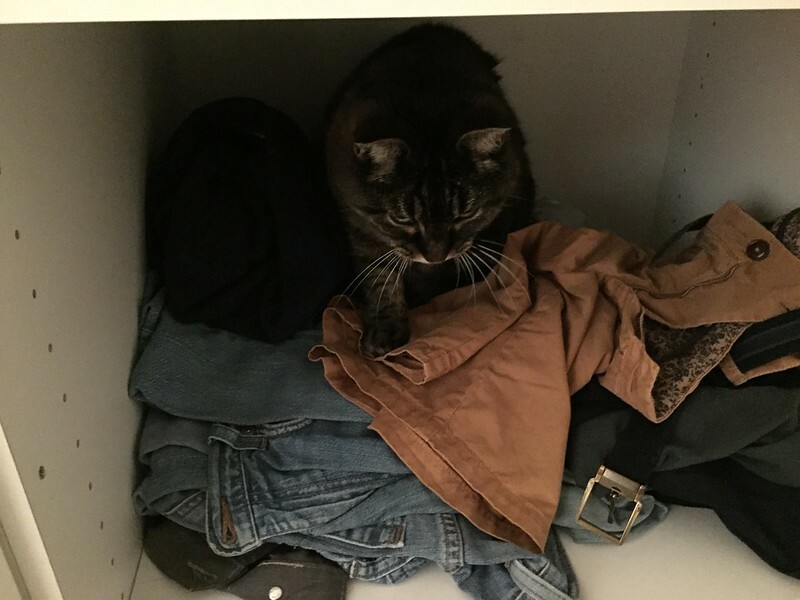 And now I have a comfortable place all to myself, resting on the soft stuff humans call clothes. I have a ceiling and a floor and three walls, what could be better? I am surrounded in safety. Of course I had to revise my teaching programme with Mrs. Human to include felines trapped behind doors that were locked by opposable thumbs. I think she has now learned her lesson, although with humans you can never be so sure. I never had faith that Mrs. Human would let me out, as she tends to be busy with human stuff now and again like using the dreaded noise monster she calls vacuum cleaner, or ignoring me completely two hours after lunch for a sleep. If she organised her sleep to coincide with my sleeps, life would be so much more comfortable for me. I usually avoid my human when possible, it simplifies my feline life. We are similar, although the human would have no sense in her life without looking after our feline needs. I had a pregnant cat have her whole litter in my husband’s cupboard. It was NOT a great place for little kitties and we had to more them all. She kept trying to move them back. Cats can be very stubborn. They certainly pick the best places and can be very possessive.